It seems that specifying an image width greater than 5800px results in GD memory crash. Wide images are necessary for scrolling very long line graphs with thousands of data points and an x axis running from zero to over 40,000 (feet). a) Is TeeChart restricting image width? b) If so, can that be increased? 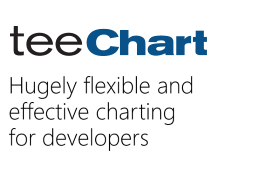 rustydiver wrote: a) Is TeeChart restricting image width? We could increase the memory allocate but we'd like to study alternatives if we could get the example mentioned above. Code below is straight from your examples at demos/Features Chart Styles>Standard>Line 2D. I can make the image up to about 6050x600 px, at 6100x600 px it will error out with this..
My actual code has more information and much greater y and x values, but the image size restriction is still pretty close to the same as your simple example chart. So it is not an issue of stretching the x axis or anything. As stated previously, if you have an x axis in feet running 8 miles or more and y values every 5 feet or so, you need a good image width to scroll for any detail or you are just looking at a scrunched accordian. If you change the class file from imagecreatetruecolor to just imagecreate, you can get a little bit wider, but other things like color in any band coloring may go to gray, etc. An increase to 128M in TChart.php will yield 10,000x600 px (far as I tested to because that is about what I need). I'll let you know if it catches fire. related with the other post. I'll back with fixed sources.